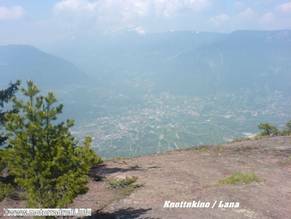 04.09.2007 began with an invitation, “Pentecost 2008 4 day trip to South Tirol!”. 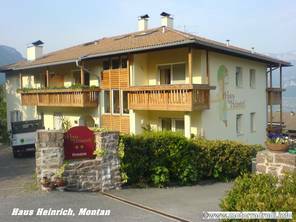 From 09.05.2008 until 12.05.2008 we were supposed to go to South Tirol, or more accurately to Haus Heinrich in Montan. The 10 double rooms were quickly reserved so I could focus on the finer details. "into the heart of the Dolomites" and "Direction Caldonazzo-Sea"
Since there was no objection or other suggestions we stuck to the original plan. Petra and I decided to start on Thursday due to the high traffic expected on Friday before Pentecost. The weather forcast called for nice weather. We met with Heike aka “Dirty Osirius” and Franz at Sonthofen and drove towards Italy! At the Oberjoch we met up with Thomas aka “Toutou” and Cathy. Through the Tannheimer Tal we went towards Namlostal (the Hahntennjoch was still closed). Unfortunaly construction stopped us after about 2km and we had to turn around since the road was closed. So we went back to Weissenbach and went to the Fernpass via Reutte. Light traffic made it quite a treat this time. Through Nassreith, Telfs and Zirl we drove towards Innsbruck. From there we drove over Igls and Ellbögen to Matrei. From here it was a short drive towards the Brenner where we met up with Rita aka “Chili” and Helmut. Due to the detour in Namlostal and a few other holdups, we met up at 14:00 instead of the planned 13:00. On the way towards Sterzing we stopped for lunch and then continued on to Brixen. Here we left the Brenner route and took a right towards Feldthurns. There was supposed to be a right towards Latzfons, but I turned right too early and we drove through Schnauders, continually climbing. Then the asphalt ended and we had to turn around. 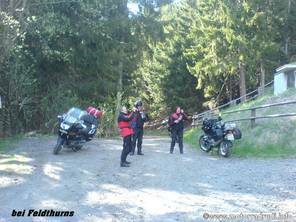 While turning around, Thomas stumbled and his new BMW K 1200LT fell on its left side. What is the saying: Only once you dropped your bike do you truly own it. Okay Thomas, you now own her! With combined effort we righted the bike and so we could continue. Back to Feldthurns and this time we really went up to Latzfons. Going up the road it is nice and wide but after the town it becomes very narrow! We drove down towards Klausen through a narrow chasm. Here we parted ways with Rita and Helmut, they attacked the direct way towards Bozen while the rest of us drove up to Villanders. Wide roads with nice curve combinations kept leading us higher. Above Villanders there is a marked way to Barbian, we followed this road. The street is also very narrow and one has to be careful with oncoming traffic. Beatiful sights in the Eisacktal are the reward for this side tour. We continued on through Lengstein towards Klobenstein and down towards Bozen. Here I wanted to follow the signage left to Trento but the traffic light was out and the cross traffic didn’t allow us to turn, so we decided to turn right into the center of Bozen. Here we got stuck in total rushhour, we continued at walking pace. Finally this adventure was over and we found our way towards Leifers and further on to Auer. At the climb towards Montan we suddenly met with Rita and Helmut again, they didn’t find the way to the guest house and were happy to see us. Together we drove up and quickly reached our destination, Haus Heinrich. Due to the many delays it was already 18:15. Total distance from Sonthofen was about 340km. We quickly got to our rooms and got changed and met up at 19:00 for a relaxed dinner. In a relaxing manner we discussed the events of the day. Petra and I wanted to see the Konttnkino (between Vöran and Haflings). Heike and Franz joined us while Thomas, Cathy, Rita and Helmut had other interests. The four of us initially drove the direct way to Bozen, where the traffic was again very heavy but still much better than the day before. Then we headed towards Sarntal and then Jenesien. This time I didn’t want to take the main route, but instead the old Jenesienstrasse, about which I’ve read several times on the Internet. The street branches off to the right after several hundred meters and then immediately to the left (Jenesienweg). The street is extremely narrow and extremely steep!!! In addition to those several tight curves, we were all happy that we had no oncoming traffic. After several kilometers we reached the end and stopped at the pull off. Looking back at the road one could plainly see the narrowness and steepness of the road. We continued on up the main road towards Jensien and from there towards Mölten. We took a right there through Vöran and we arrived at the Gasthof Alpenrose. Here we parked our bikes and made our way towards the Knottnkino. The path takes about 30 minutes, sometimes very steep, but it is worth it! The view from up there is simply amazing! There are about 30 “cinema seats” set in the ground and one can watch this “Nature Movie” in all its splendor. I can only recommend to anyone coming here to take the time and do this excursion! We went back to the bikes and we continued through Hafling towards Meran. 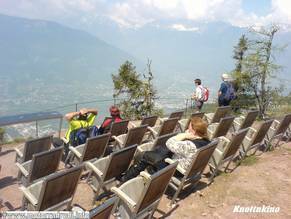 The entire route from Mölten is characterized from the many glorious views to Meran and into the Etschtal. 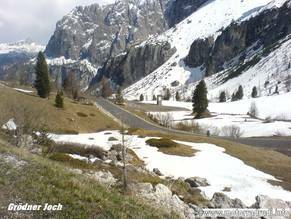 The road led us through Lana up to the Gampenjoch. There we stopped for lunch. Through Fondo it quickly went up towards the Mendelpass and from there even further up to Monte Pénegal, another wonderful vantage point and a road full of curves that led up to it. After a ice cream stop in Kaltern we followed a side road (labled Laimburg) towards Auer and up to Montan. Total distance about 170 km. A few of the additional participants, Chris aka Sir Footloose, Gabi, Peter aka gehtnixle, Ingo, Rudi aka katfisch, Inge, Joachim aka bartl, and Sylvia had already arrived. Only Kai-Uwe aka KUB0711, Andrea and daughter Alea were missing, they didn’t arrive until about 00:30 on Montan). Dinner was at 19:00 again and afterwards we enjoyed jovial discussions. After we had breakfast at 08:00 we started on our first group tour shortly after 09:00. Unfortunately Sylvia could not join us, on the trip there she had a small accident that affected her lower leg (she couldn’t ride her own bike until Monday on the way back). “Into the heart of the Dolomites” was on the agenda today and we headed out on the main road towards Cavalese. Andrea took the warning of the guest house hostess about police controls too literally and stuck exactly to the speed limits, so we drove very leisurely all the way to our first gas stop at Predazzo. 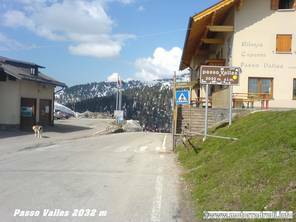 After a short discussion we picked up the pace and headed towards Passo di Valles (2033 m). After the turn off to this pass I drove at a brisk pace and was amazed that Andrea was almost stuck to the back of my bike. The Deauville was very quickly and safely spirited up the mountain by Andrea - well done! 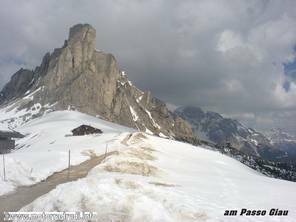 The others made it up this magnificent road bit by bit and then we proceeded towards Passo Giau (2236 m). At first the road through Falcabe took us down to Cencenighe. 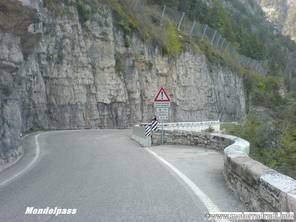 Then we headed through Alleghe and we followed the signs to Selva di Cadire and Passo Giau. Once on top we decided on a coffee break. A few Alpenbikers were missing though, because we didn’t wait for them at the bottom of the pass. But eventually they reached the summit and for the rest of the tour we always waited for the last person! In a “free drive” (everyone goes at their own pace without having to worry about the group) we descended Giau and then ascended Falzaregopass (2105 m). Here we waited shortly for everyone to regroup and we headed up Passo di Valparola (2192 m). We drove through St. Kassian towards La Villa/Stern. There we stopped for lunch. 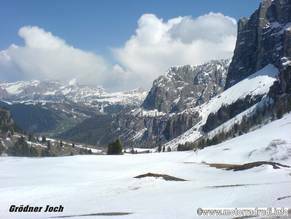 After lunch we drove through Corvara up to Grödner Joch (2121 m). On the way up there we saw signs stating that the pass would be closed between 15:00 and 21:00. It was about 14:45 and I assumed that if we made it up we will make it down! Wrong!!! Heike had a small fall on the ascent, it didn’t cause much damage, but it did cost us some time. So once everyone was at the top we wanted to drive down into the Grödnertal and all of the sudden we stood at a closed gate! Shi….!!! Luckily we could drive around the gate on the right like some other motorcyclists and so we tried our luck. However, 2 to 3 km later there was another gate, one that we could not drive around. What now? Turn around? The other motorcyclists started lifting the gate as much as possible in the middle and pushed the bikes, titled to one side, under the gate. With the help of everyone we tried our luck and one by one the bikes “drove” under the gate. Our three LT 1200 drivers where a bit skeptical and decided to turn around. Once they reached the upper gate they notified us by cell phone and drove via Campolongo and Pordoi via the direct route back to Montan (they arrived about 15 minutes before us). 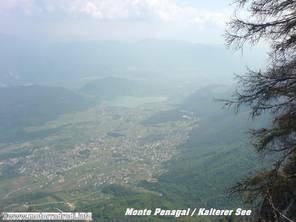 The others that “drove” under the gate followed the planned route and drove via Grödnertal and Panider Sattel (1437 m) to Kastelruth. 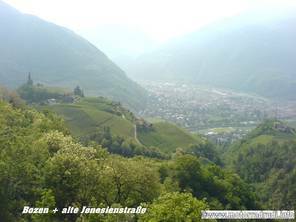 From there through Völs am Schlern we followed wonderful curve combinations down into Bozen. 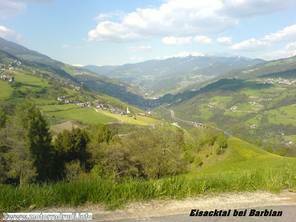 Enterning Bozen (large traffic circle) we drove left up the small but great road towards Kohlern (Colle) – this route is just wonderful!!! 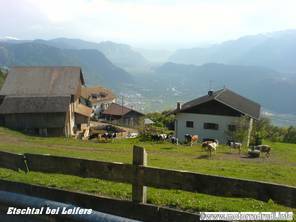 Driving down – with wonderful views – we eventually arrived at Leifers and through Auer again back to Montan. Total distance about 250 km. That evening we met at about 19:00 at the pizzeria Schloss Enn and we let the day fade away with excited conversation.